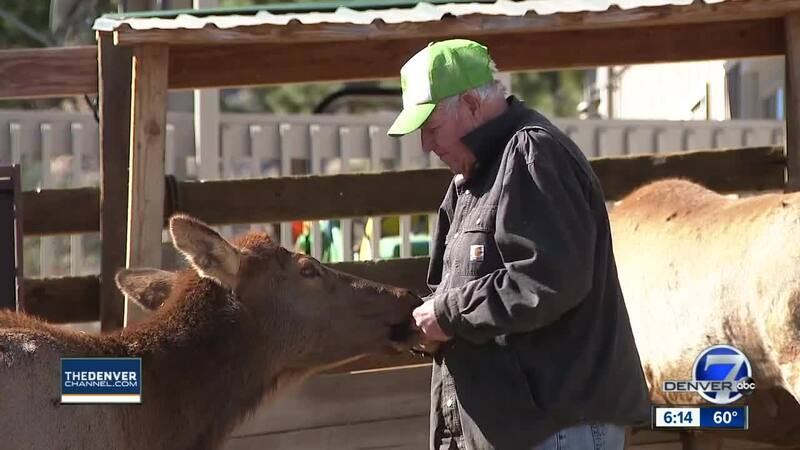 Leo and Molly Kemper have been caring for Annie the elk since she was just five days old. She's now nearly 29 years old. ESTES PARK, Colo. – The mountain town of Estes Park, Colorado is known for its scenery and tourists – it’s the gateway to Rocky Mountain National Park and is home to the iconic Stanley Hotel, which inspired Stephen King to write “The Shining” – as well as a few local characters, like Lee and Molly Kemper. The retired restaurateurs are animal lovers and tend to a llama, a few alpacas and another animal one might not expect – an elk named Annie. For decades, Lee and Annie have been inseparable. The Kempers took Annie in to rehabilitate her after her mother abandoned her. She’s stuck around and has since become a part of their family. “I love her to death. She’s like one of my kids,” Lee said. Over the years, Annie even gave birth to a calf and her daughter had babies of her own. Those calves also chose to stick around instead of living on their own in the wild. With all the love and care Lee has given Annie over the years (not to mention plenty of Mike and Ikes, her favorite candy), one thing he hasn’t been able to protect her from is time. At nearly 29 years old, she’s lived much longer than most elk do in the wild. Annie now suffers from arthritis and struggles to get around. It’s not clear how much more time she’ll have with her adopted family. As the autumn of Annie’s life draws near, Lee has been quietly making plans to keep her memory alive. He’d like to see her immortalized with a bronze statue in town, much like another elk, Samson. His neighbors created a GoFundMe to help raise money for this . For more information on Annie and the Kempers, log on to kenosllamaranch.com .